Introduction: Primary health care providers have an opportunity to motivate and improve the oral health of children. Hence, the objective of the present study was to assess the knowledge and attitude of medical and dental graduate students on early childhood oral health (ECOH). Materials and Methods: A cross sectional study was conducted among medical and dental graduate students to assess the knowledge and attitudes on ECOH through the questionnaire. The data were analyzed using chi-square analysis and Newman-Keuls post hoc procedure, with level of significance set at 0.05. Results: All the students who were present for a lecture session responded for the questionnaire, majority of them were females (68.50%). Final year dental students had better knowledge than first year dental and medical students (P < 0.01). Majority of students thought textbooks are the primary source of information and mass media would be better source to gain knowledge about ECOH (54.52%). Majority of dental students showed enthusiasm to learn about ECOH. Conclusion: Knowledge on ECOH among medical students was inadequate, who also lack enthusiasm for better understanding on ECOH, compared to dental students. Mass media would be a better means of imparting knowledge on ECOH. Evidence strongly suggests that establishment of' dental home' which is based on 'medical home' concept by American academy of pediatrics (AAP), should be within 6 months of eruption of the first tooth and no later than 12 months of age, to conduct caries risk assessment and provide parental education including anticipatory guidance for prevention of oral disease. Pediatricians and family physicians have the opportunity to improve and motivate the oral health of children due to their early and frequent contact during well-child and chronic condition visits. The strategy of utilizing primary care medical providers (Anganwadi workers and rural medical practitioners) to promote oral health is essential in rural region where there are few dentists and even fewer pediatric dental specialists for countries like India. The use of primary health care givers as first line of defense in children is an innovative approach that provides an opportunity to interrupt unhealthy behaviors and offer strategies to move parents from inaction to action. However, many studies worldwide reveal that primary care givers (medical providers) have inadequate knowledge regarding early childhood oral health and often lack relevant training. ,,,,,, It is a feasible option to train medical graduate students during their professional course and translate the knowledge into practice. However, both the medical and dental students' knowledge and attitudes on early childhood oral health (ECOH) have not been tested in India and the objective of the present study was to evaluate the same. 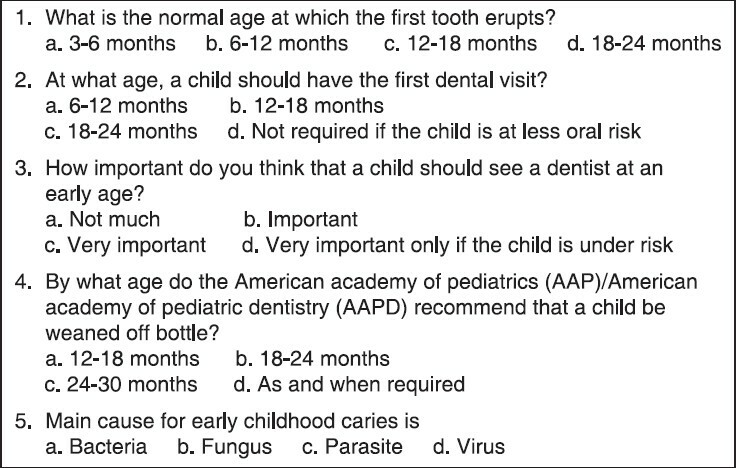 Questionnaire included three sections: Demographic data (age, gender), knowledge [Figure 1] that included time of first tooth eruption, about first dental visit, importance and opinions on first dental visit for children, AAP/AAPD recommendation on bottle weaning and main cause for early childhood caries and later part [Figure 2] on attitude, self assessment and source of information on this topic. The ethical approval was obtained from institutional ethical committee, Narayana Dental College. The students were approached during college hours, after a lecture session and explained about the nature, goals and voluntary nature of the study. After obtaining the informed consent, the questionnaire was distributed and collected soon after completion. We hypothesized that medical students were not well aware of early childhood oral health. The data collected were analyzed using intercooled STATA Version 9.2 (StataCorp LP). The groups were compared for correct responses on Q1 and opinions on Q2, using Chi square analysis. Mean knowledge score between groups was compared by Newman - Keuls Post hoc procedure and a P-value of less than 0.05 was considered to be statistically significant. All the students who were present for the lecture session responded to the questionnaire. The demographic distribution of students is shown in [Table 1]. The number of medical students (62.20%) was more, compared to dental students (37.80%). Almost all first year students were in the age group of 18-21 years, final year students in age group of 22-26 years and majority of participants were females (68.50%). For knowledge questions [Figure 1], on age at which first tooth erupts, D1 students (76.83%) had better knowledge than D4 students (73.21%), which was not statistically significant. D1 students showed better knowledge than M1 students (56.45%) and M4 students were better than M1 students (56.45%), with both the values being statistically significant [Table 2] and [Table 3]. About 57.14% of D4 students knew the recommended age for child's first dental visit and the value is statistically significant with D1 and M4 students. The D1, D4 and M4 students thought that, child visiting the dentist at an early age is very important, compared to M1students. Majority of first year students answered that child's first visit is not required if the child is at less oral risk. D4 students (50%) answered better, on the recommended age for a child to be weaned off bottle than D1 and M4 students (29.27% and 38.83%) and final year students (M4, D4) knew the answer better than first year students (M1, D1). Eighty three percent of students knew that bacteria are the primary cause for ECC. There is no statistical significance in between groups, except, M4 students (88.35%) had better knowledge than M1 students (75%) [Table 2] and [Table 3]. For questionnaire on self assessment and source of information, majority of students thought that they have moderate knowledge on early childhood oral health (ECOH) (41.64%) followed by little knowledge (35.89%). Fifty five percent of D4 students thought that they have moderate knowledge. As many as 60% of students had moderate satisfaction with self assessed knowledge. D1 students (76.83%) had moderate satisfaction which is higher than other groups. Dental students showed more enthusiasm to learn about ECOH and thoughttext books are the primary source of information on ECOH. M4 students answered it astextbooks (33.98%) and friends (33.01%) and M1 students answered haphazardly for the primary source of information on ECOH. Most of the students thought mass media (54.52%) is the better source to gain knowledge about ECOH followed by lecture classes (29.04%) [Table 4]. There was a statistically significant difference in mean knowledge score between D4 with D1, M1 and M4. M1 with D1 and M1 with M4 [Table 5]. The overall results revealed that dental students had better knowledge than medical students and final year students (M4, D4) over first year students (M1, D1). 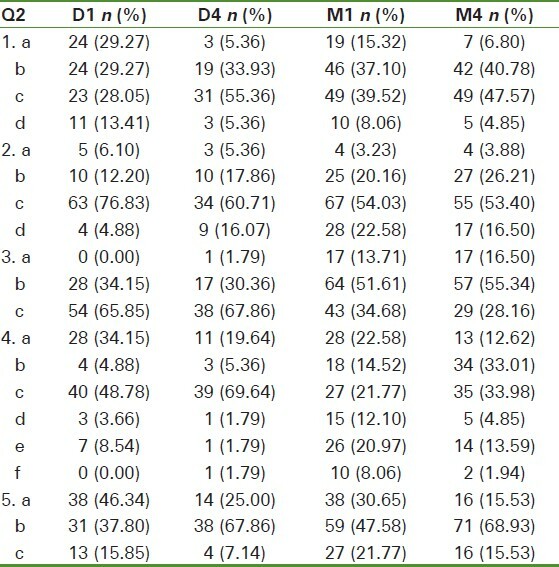 A similar finding was noted in previous studies, ,, however, D1 students performed better than D4 students regarding knowledge of "age of first tooth eruption", which could be correlated to the change in curriculum of BDS in India, with dental anatomy being taught in first year and also D4 students answered better than M4 students on "the recommended age of weaning from bottle", which could be due to the fact that, dental students are emphasized more on the preventive measures of ECC during the course. Another reason perhaps is that the M4 students were in the middle of the academic year when compared to D4 students, who were at the end of academic year. On the age of first tooth eruption, M4 students showed better knowledge than M1 students as they had finished dentistry posting in their third year and D1 answered better than M1, D4 as the D1 students are being taught about dental anatomy in their teaching curriculum. AAPD recommends that, the child should see the dentist within 6 months of eruption of the first primary tooth and no later than 12 months of age. Traditionally, the developmental age for initial dental visit was thought to be 3 years, the rationale for this being, children are better manageable at this age and treatment will be more effective and efficient. However, early interventions are needed to educate parents on oral hygiene, prevention of dental injuries and ECC. M4 and first year students (D1, M1) had poor knowledge on first dental visit and most of them thought that first dental visitis not required if the child is at less oral/dental risk and D4 students had better knowledge than medical and D1 students, which was an expected trend andalso noted in some previous studies, ,, but in contrary, this response was lower in the present study. Most of the students knew that bacteria is the primary cause for ECC, which is an expected trend and the endocements on television could be the reason for the better awareness on this answer. Most of the students thought that they have moderate to little knowledge in ECOH and are moderately satisfied with their self assessed knowledge. Dental students showed more enthusiasm for learning subject than medical students. Text books are the primary source of information on ECOH for dental students. Majority of M4 answered that the main source wastextbooks and friends, as M4 students share common hostel with dental students at this campus, leading to the sharing of knowledge on ECOH. However, the answers of M1 students were haphazard on the primary source of information; with most of the students thinking that mass media is the better means to gain knowledge about ECOH followed by lecture classes. The mean knowledge score was better for D4 students over others and final year students over first year students, thus confirming our alternate hypothesis. Results may not be generalized to entire medical and dental students in India, as students from one medical/dental institution were surveyed in the present study. In spite of these difficulties, the differences found among the groups are likely to approximate the true differences. Medical students require adequate training in ECOH and thus instilling positive attitude towards prevention of oral diseases at professional as well as community level as primary care giver. All newly graduated dentists and medical practitioners need to update their knowledge and guidelines on preventive oral care. Douglass JM, Tinanoff N, Tang JM, Altman DS. Dental caries patterns and oral health behaviours in Arizona infants and toddlers. Community Dent Oral Epidemiol 2001;29:14-22. The American Academy of Pediatric Dentistry. Policy on Early Childhood Caries (ECC): Classification, Consequences, and Preventive Stratergies. Pediatr Dent 2013;33:47-9. Seow WK. Environmental, maternal, and child factors which contribute to earlychildhood caries: A unifying conceptual model. Int J Paediatr Dent 2012;22:157-68. Seow WK. Biological mechanism of early childhood caries. Community Dent Oral Epidemiol 1998;26:8-27. Priyadarshini HR, Hiremath SS, Puranik M, Rudresh SM, Nagaratnamma T. Prevalence of early childhood caries among preschool children of low socioeconomic status in Banglore city, India. J IntSoc Prevent Communit Dent 2011;1:27-30. Sankeshwari RM, Ankola AV, Tangade PS, Hebbal MI. Association of socio-economic status and dietary habits with early childhood caries among 3-5-year-old children of Belgaum city. Eur Arch Paediatr Dent 2013;14:147-53. Sanchez OM, Childers NK, Fox L, Bradley E, Physician's views on pediatric preventive dental care. Pediatr Dent 1997;19:377-83. Jawdekar AM. Aproposed model for infant and child oral health promotion in India. Int J Dent 2013;2013:685049. Kumari NR, Sheela S, Sharada PN. Knowledge and attitude on infant oral health among graduating medical students in kerala. J Indian Soc Pedod Prev Dent 2006;24:173-6. Chung MH, Kaste LM, Koerber A, Fadavi S, Punwani I. Dental and medical student's knowledge and opinions of infant oral health. J Dent Educ 2006;70:511-7. Rong WS, Wang WJ, Yip HK. Attitudes of dental and medical students in their first and final years of undergraduate study to oral health behavior. Eur J Dent Educ 2006;10:178-84. Shivaprakash PK, Elango I, Baweja DK, Noorani HH. The state of infant oral healthcare knowledge and awareness: Disparity among parents and healthcare professionals. J Indian Soc Pedod Prev Dent 2009;27:39-43. Mani SA, Burhanudin NA, John J. Malaysian undergraduate's knowledge and opinions on early childhood oral health. Eur J Paediatr Dent 2012;13:64-8. Adeghe HA, Ehigiator O, Azodo CC, Ehizele AO. Nigerian clinical level medical students' knowledge of dental specialty. Ann Med Health Sci Res 2012;2:157-60. AlYousef Y, Damiano P, Weber-Gasparoni K, Qian F, Murph J, Nothwehr F. Medical students' child oral health related knowledge, practices and attitudes. Eur J Dent Educ 2013;17:218-24. Fux-Noy A, Sarnat H, Amir E. Knowledge of elementary school teachers in Tel-Aviv, Israel, regarding emergency care of dental injuries. Dent Traumatol 2011;27:252-6. Hashim Nainer SM, Mohummed S. Diet counseling during infant oral health visit. Pediatr Dent 2004;26:459-62. Mouradian WE, Berg JH, Somerman MJ. Addressing disparities through dental- medical collaborations, part 1. The role of cultural competency in health disparities: Training of primary care medical practioners in children's oral health. J Dent Educ 2003;67:860-8. Mouradian WE, Reeves A, Kim S, Evans R, Schaad D, Marshall SG, et al. An oral health curriculum for medical students at university of Washington. Acad Med 2005;80:434-42. Skelton J, Smith TA, Betz WT, Heaton LJ, Lillich TT. Improving the oral health knowledge of osteopathic medical students. J Dent Educ 2002;66:1289-96. Douglass JM, Douglass AB, Silk HJ. Infant oral health education for pediatric and family practice residents. Pediatr Dent 2005;27:284-91. Graham E, Negron R, Domoto P, Milgrom P. Children's oral health in the medical curriculum: Collaborative intervention at a university-affiliated hospital. J Dent Edu 2003;67:338-47.